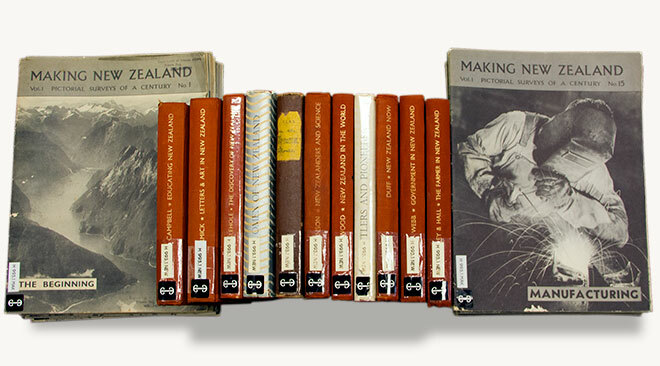 This image shows the 20-part centennial magazine, Making New Zealand, and the 11 centennial history books that were published by the Centennial Branch of the Department of Internal Affairs between 1939 and 1941. The Making New Zealand series was described as 'pictorial surveys of a century', and the illustrations, organised by John Pascoe, added significantly to their appeal. There had originally been 13 books planned, but Āpirana Ngata's one on Māori was never completed, and Bill Sutch's volume on social services was considered unsuitable and was subsequently printed by Modern Books in 1941 as Poverty and progress in New Zealand.